Onze prachtige blokhut is gelegen op 3. 5 acres van privé-eigendom in de prachtige, schilderachtige Appalachian Mountains! Breng uw camera en een eetlust voor de lol, of gewoon genieten van de rust van de bergen. De cabine is slechts 6 mijl van Aska Road en toch dicht bij het historische centrum van Blue Ridge in Fannin County. Het heeft 2 slaapkamers en 1 en 1/2 baden en geschikt voor 4-5 gasten. HUGE buitenterras met picknicktafel! De berg weg naar de cabine is ½ mijl; Het is gedeeltelijk geplaveid, gedeeltelijke grind en het is steil. Een laag naar het grondvoertuig wordt niet aanbevolen. 7 NACHTWEKEN, JE KIJKT OP DE 8E DAG! Een slaapkamer heeft een king size bed, de tweede slaapkamer heeft een queen size bed. Er is ook een koningin slaper en een twin slaper aan kinderen. Deze hut heeft GEEN bubbelbad. * Alle comfort van thuis! * De Toccoa rivier, waar u kunt genieten, slangen, kanoën, zwemmen en vissen. * De beroemde Toccoa Riverside Restaurant. Great secluded cabin with wonderful views. Thank you Anthony, would love to host you again anytime! This is a two bedroom with a one and half bathroom so it is not very large but I think for the money it's hard to beat! It was great for my wife and I to celebrate our 41st wedding anniversary! It is in a fairly private location. You can't really see the other homes very easily but they are within hearing distance when the neighbors are outside, very quiet and peaceful. The driveway is pretty steep and I would recommend four wheel drive when it snows to access the cabin and be safe. It is around a ten minute drive to Mercier Orchard and a 5 minute drive to get on 76 which gets you to just about any other town in the vicinity. There are plenty of hiking trails around the area although we didn't go on them but went to Tullulah Falls which was beautiful, touristy and about an hour drive. We were scheduling a last minute weekend trip. Donna responded immediately to our reservation request and made everything super easy! 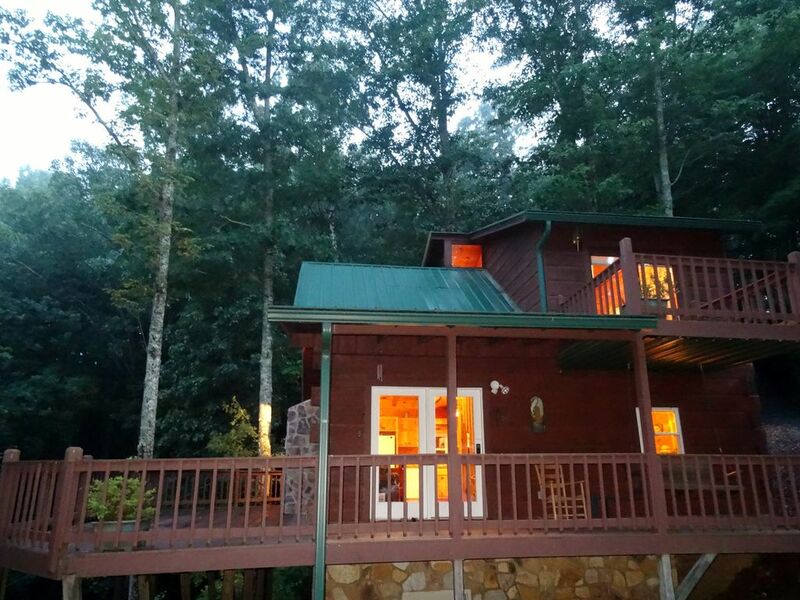 The cabin is cute and cozy and offers great views of the north Georgia mountains. Fantastic Jim! Hope to host you again sometime, thank you for visiting! Cabin was well equipped with everything you need except for food of course. Very clean and neat. The views from the deck were outstanding! This cabin was perfect, far away from everyday life but still close to everything . It is 10 mins from Blue ridge downtown, if you need to make a quick grocery run or for get down for lunch or dinner and its still secluded enough that we were treated by a bunch Deers staring back at us while checking in. Cabin itself was beautiful and cozy, it has everything you need including a great collection of books and music, and is right next to beautiful Aska Trail head.This place has one of the most bueatiful sunrises I have ever seen. Thank you Donna for letting us stay here ! Thank you Raj! It was my pleasure to host you and your family, we would welcome you back to our small slice of paradise in the mountains anytime!